Humor can be a most effective weapon against your adversaries, especially when more extreme measures are unavailable. MLP management teams have made many poor capital allocation decisions in recent years, providing a rich source of material for an observer armed with both wit and a deep knowledge of the sector’s history. 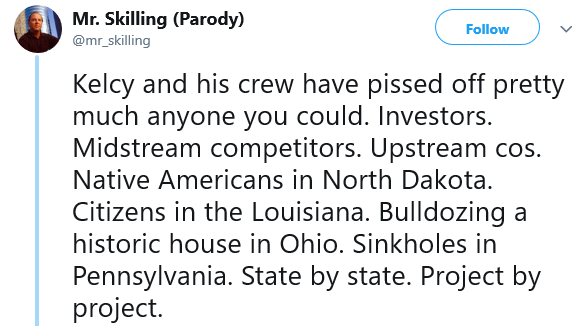 On Twitter, such a combination exists in the anonymous Mr. Skilling, who has been aiming rapier-like thrusts at many of the industry’s worst offenders, to hilarious effect. Inspired by the NCAA basketball bracket, he constructed a 64-team equivalent for present and past MLP managements. 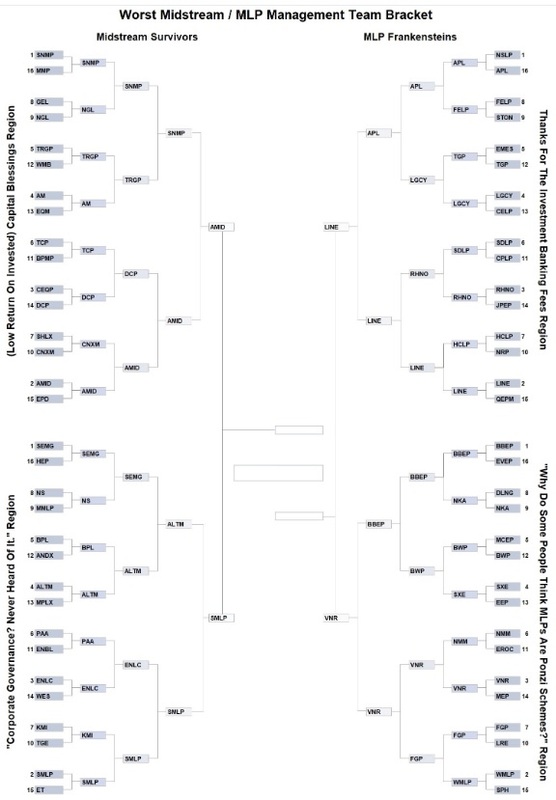 The winner of each match-up was decided by votes, with Mr. Skilling helpfully providing recent form, such as “total equity value destroyed”, number of distribution cuts, and the priceless “Ponzi Ratio” (equity raised divided by distributions paid out). This is one competition nobody wants to win, and any progress through the tourney presents an investor relations challenge. Competitors were assigned to four regions, with names like “Corporate Governance? Never Heard Of It”. They were seeded, with the top seeds being assigned to the worst offenders. Perhaps this will lead to a new due diligence question (“What’s the highest seeded holding in your portfolio?”). Prior to each match-up, Tweeted commentary set the stage. Some companies had achieved a head start by already going bankrupt – and Vanguard Natural Resources’ two bankruptcies gave them a clear edge. HiCrush (HCLP) showed an exquisite touch in fleecing their investors. 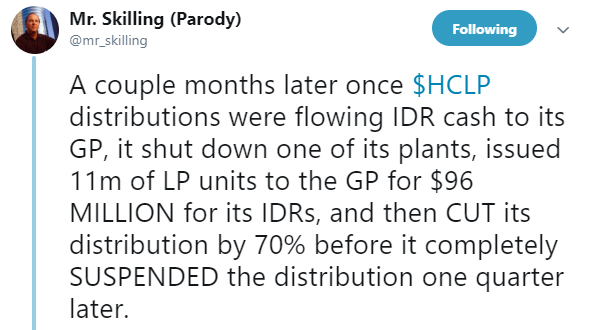 They temporarily raised their distribution to an unsustainable level which threw off increased Incentive Distribution Rights (IDR) payments to the General Partner (GP). These IDR’s were then cancelled in exchange for new equity issued to the GP, before the distribution was then slashed. 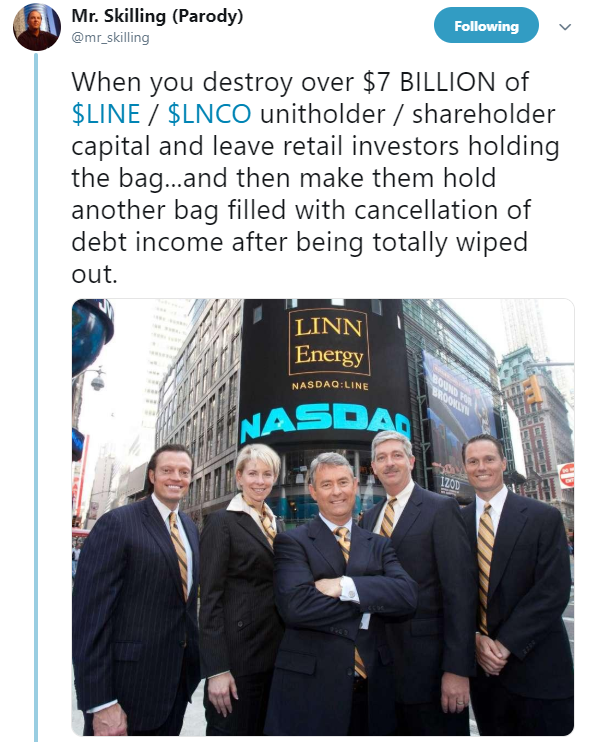 Such a record would seem to be unassailable, but Linn Energy’s bankruptcy provided unanswerable competition by saddling their investors with an additional taxable gain for debt forgiveness on top of their worthless LP units. Failed companies should dominate such a tournament, but Targa Resources (TRGP) progressed to the “Sour Sixteen”, propelled by repeated poor investment decisions led by CEO Joe Bob Perkins of the now infamous “capital blessings” comment. Mr. Skilling spares few, including Alerian who inducted Energy Transfer CEO Kelcy Warren into their Hall of Fame. 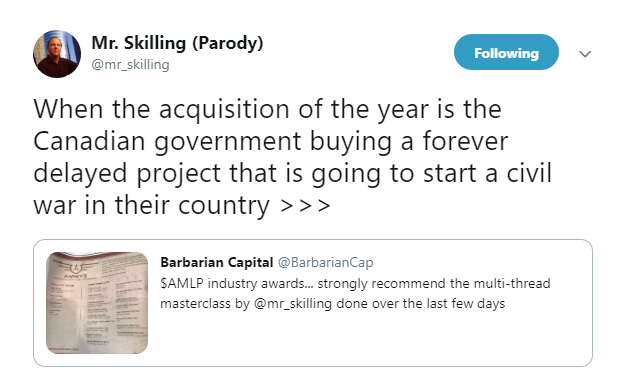 Kinder Morgan’s sale of their TransMountain Expansion also won an award for best acquisition, although there’s little doubt the Canadian taxpayer got the worse end of the deal. Hinds Howard, who follows the sector for CBRE Clarion Securities, was inspired to add this little gem. The humor is biting, and entertaining if you’re not financially scarred by the miscreants. But beyond the hilarity there are a couple of takeaways. 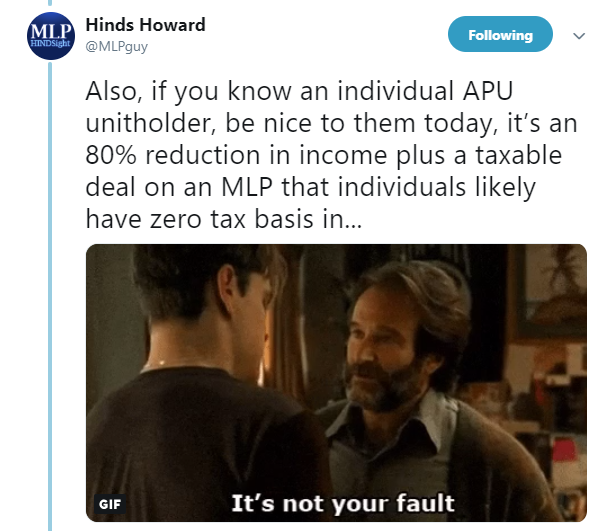 The traditional MLP-GP structure, under which MLP investors endured weak governance rights and paid IDRs to the GP, has always looked to us like the relationship between a hedge fund and the hedge fund manager. It’s widely accepted that hedge fund investors have done poorly (see The Hedge Fund Mirage). 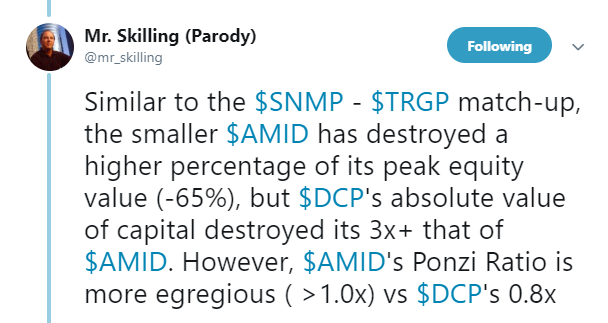 This recognition is why we have long favored the GP versus the MLP, although few such situations remain. It’s also why we don’t invest in any MLP that’s paying IDRs. Our portfolios haven’t avoided poor stewards of capital, but in always being aligned with management we have sidestepped the worst examples listed above. The other point is that the industry has changed substantially. Simplifications have removed the GP’s ability to direct their MLP into dilutive projects while increasing IDRs. Governance has improved with the conversion of many large MLPs into corporations. Projects are increasingly self-financed and leverage is coming down. 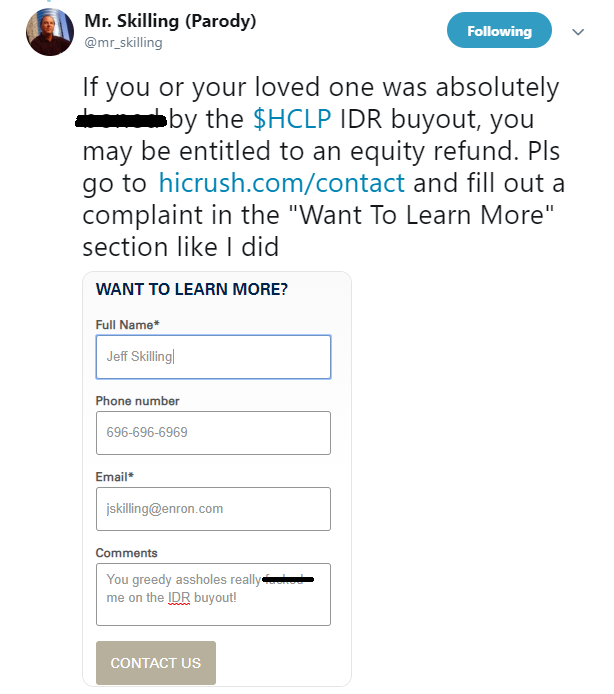 The sheer quantity of episodes of investor abuse reflect the opprobrium so widely earned, and yet reputations lag reality on the way down as well as on the way back up. Depressed valuations reflect the past, far more than the future of sharply growing cashflows. 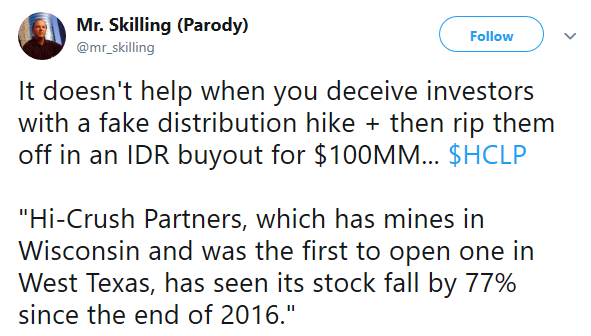 Investors who learn from past mistakes, amply displayed on Twitter, can exploit a sector still priced for the misdeeds of old while positioned for a much better future. The final is on Monday, April 8th. Make your voice heard by voting. We are invested in ET, KMI, TRGP. We are short AMLP.